that the company’s activities are aimed at quality assurance. Quality management system concerns not only the quality of products, but covers all spheres of an enterprise. This includes proper operation of equipment and machinery, production standards, responsibility for the quality performance of duties of each employee, recording of customer requests and feedback, as well as constant and continuous quality control of raw material input and finished product yield. The company conducts inspection audits annually, and recertification audits to confirm the conformity of the quality management system every 3 years. 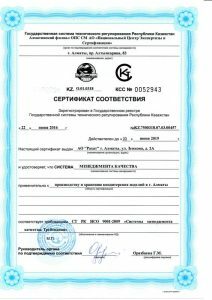 In August, 2018 the Almaty branch of the Management Systems Conformity Assessment Body “National Center for Expertise and Certification” JSC once again confirmed the conformity of the quality management system. The Certificate of conformity No. KZ.7500318.07.03.00457 was issued for compliance with the requirements of СТ РК ISO 9001 – 2016 valid until 22.06. 2019. In 2013, a food safety management system based on the HACCP principles (HACCP – Hazard Analysis and Critical Control Points) was introduced and certified for compliance with the requirements of СТ РК 1179-2003. The primary motive behind the introduction of this system was the adoption and implementation of the technical regulations of the Customs Union ТР ТС 021/2011 “On food safety” which regulates the requirements for ensuring food safety through risk analysis and critical control points. 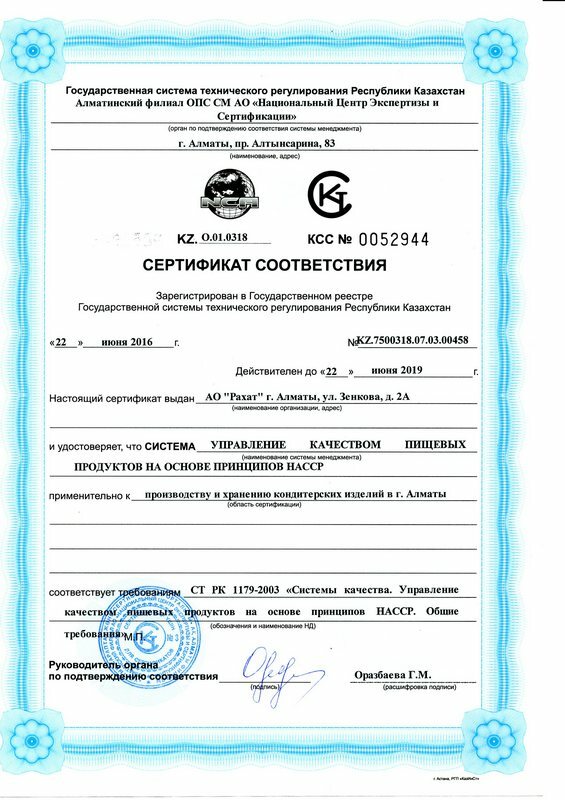 In August 2018 the Almaty branch of the Management Systems Conformity Assessment Body “National Center for Expertise and Certification” JSC confirmed the compliance of the food quality management system on the basis of the HACCP principles and the validity of the certificate of conformity No. KZ.7500318.07.03.00458. The implementation of the HACCP system in Rakhat JSC has confirmed and clearly demonstrated compliance with the established and legislative requirements in the field of food safety.